Chalkspiration starts by automatically converting your image to chalky outlines with light shading then allows you to place objects from a library of included flourishes, banners, embellishments and fonts. The first button is used to add clipart that has been included with the app. The next button reveals a text editor that you can use to add custom text to your image. The last button will ERASE ALL YOUR OBJECTS use with caution. 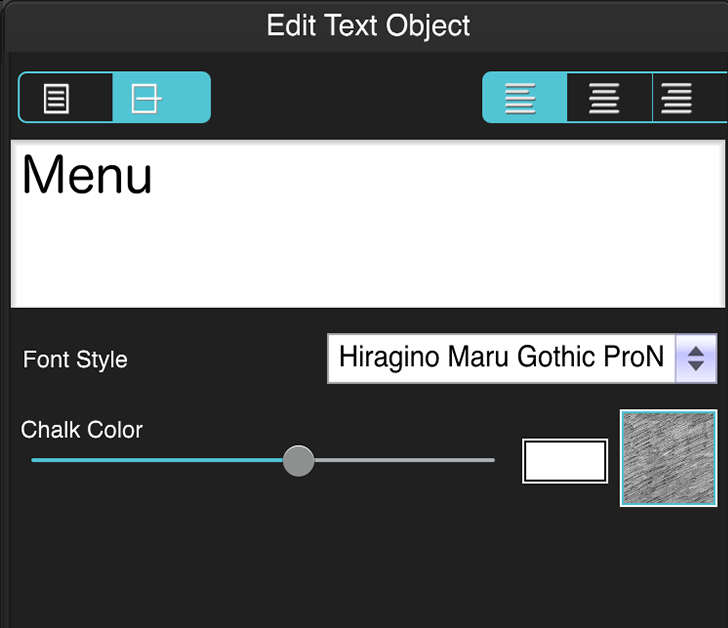 Edit Objects - Use the Edit Object Button to open the Edit Object window (the Edit Object window will change depending on what type of object you have selected). Rotate/ Flip Horizontally/ Flip Vertically - Use these buttons to rotate your image or to flip it horizontally or vertically. Chalk Color - Use the colorbox to choose the color of your chalk, use the slider to adjust the colors opacity and the thumbnail to choose the texture of the chalk. Shade Strength - Adjust the opacity of the shaded areas. Shade Style - Choose which parts of your image are shaded in. Outline Detail - Move right to make your outline more accurate. More Detail - Add more detail to the oultine. Edge Style - Choose Round or Square to add a faded edge around your image blending it into the background. Text Alignment Buttons - Pick a left, center or right orientation for your text. Font Style - Choose a font style to use. Brush on color - Go to the 5th Tab to view the Brush Tools. Brush Color - Choose a color to brush onto your chalk art. Erase - Clicking this box will change the brush to an eraser that you can use to erase color that had previously been brushed on. Reset - This will remove all the brushed on color. Chalkspiration includes four tabs which can be used to customize your image. Border - Change the opacity of the border. Use the color box to choose a color for the border. Width - Choose the thickness of the border. Corner - Use the slider to make the corners of your border rounded. Inset - Adjust the distance the border is from the edge of your photo. 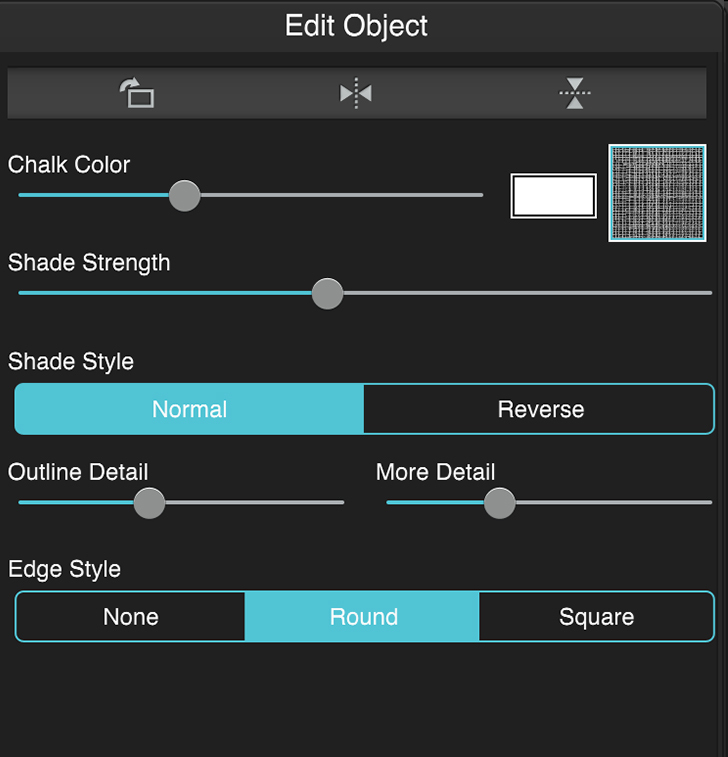 Chalkboard Texture - Choose a texture for your Chalkboard and use the slider to adjust its opacity. Add Object - Add some accents to add character to your chalk art. Add Text - Add text to your chalkboard with a variety of different fonts. Reset Objects - Removes all objects that have been added and resets the image back to the original size. 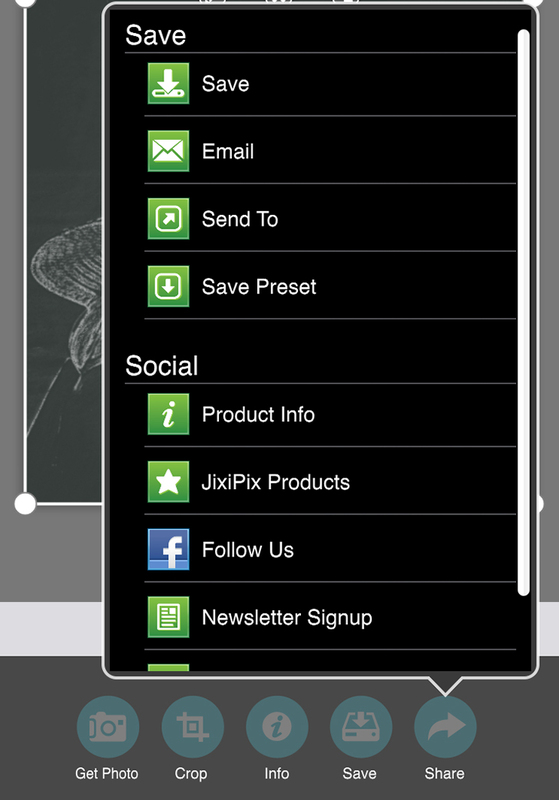 Jixipix Info - Brings you to this page. Settings - Change Image output size, Logout of Facebook and Tumblr, and rebuild the built in presets. Mail - Opens up your email so you can share your photo with friends and family. Tumblr - Opens Tumblr's login screen, once logged in you can share your image on Tumblr. Print - Allows you to print using a connected printing device. Once you have applied a preset and modified it using the adjust tabs, you can save your own custom preset by using the "Share" button on the main screen and choosing "Save Preset" off the menu. To delete a preset, press down on a thumbnail and hold until a red "X" appears, then tap to delete it.